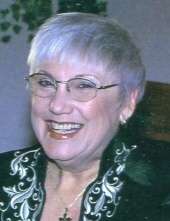 Elizabeth Jean Harris Gerbitz Roberts, 75, of Mustang, Oklahoma passed away on Saturday, January 26, 2019. Elizabeth was born in Hamilton, Ohio on August 7, 1943. She graduated from Tahlequah High School in 1961, married Jesse Gerbitz in 1962, and moved to California right after marriage. She is survived by one son, Eric and his wife Karen, their three children Heather, Carter, and Paris; three step daughters Stacy, Lisa, and Chanel plus grandchildren by fiance’ and caregiver Ron Scheele. Her parents and four siblings preceded her in death. Elizabeth fought a continuous battle with Idiopathic Pulmonary Fibrosis (IPF) and Rheumatoid Arthritis (RA) for years before her death and journey to be with her Lord and Savior. To send flowers or a remembrance gift to the family of Elizabeth Jean Roberts, please visit our Tribute Store. "Email Address" would like to share the life celebration of Elizabeth Jean Roberts. Click on the "link" to go to share a favorite memory or leave a condolence message for the family.